How do I find clients as an introvert? How to not feel like a fraud? how to service a client even if **I** personally don’t know how to get the work done (but I could outsource it)? Let us know what you think and send your questions through using the comments below. Wow, that was some really good tips. I’ve been struggling for over a year after graduating from college and didn’t realize I was an introvert and I guess being one makes me really not want to admit that. I know I was not always that way. When I was in high school I was very out going, but a bit shy around people I didn’t know. I’m also a person that never really met a stranger. So I guess I’m that in between thing someone mentioned (sorry I’ll have to go back and listen to that comment). My problem now really is because of allot of hard to please clients I’ve came across that shot down my confidence down a bit. Plus all the clients that want something for nothing. I struggle with sticking with what I feel I’m really worth or know I what should be getting for ask my hard work. Hi Cay! I deciphered your message well enough, I can be a real typo expert at times myself! It sounds like you have had your confidence knocked, but don’t worry, hard to please clients can be handled, you just need to diagnose them early and know what to do (there is an all-or-nothing cure to such situations, but you need to frame it right in order to be effective). It is a bit long to share in this comment, but I have just added this topic to the list of future discussions for the podcast, so keep listening as I would love to do a special segment on this and I am sure it will really help you! Remember, your clients do not set your value, you do. Just think how small their window into your life is… they are only judging what they are seeing through an incredibly small window, based on their own experiences up to now which may indeed be terrible, so just remember that what they think of you has nothing to do with your value, only how much of it they perceive. Thank you guys, your the greatest! Hey guys, great podcast! Thanks for sharing some valuable tips. I particularly appreciated the viewpoint of focusing on serving the client. 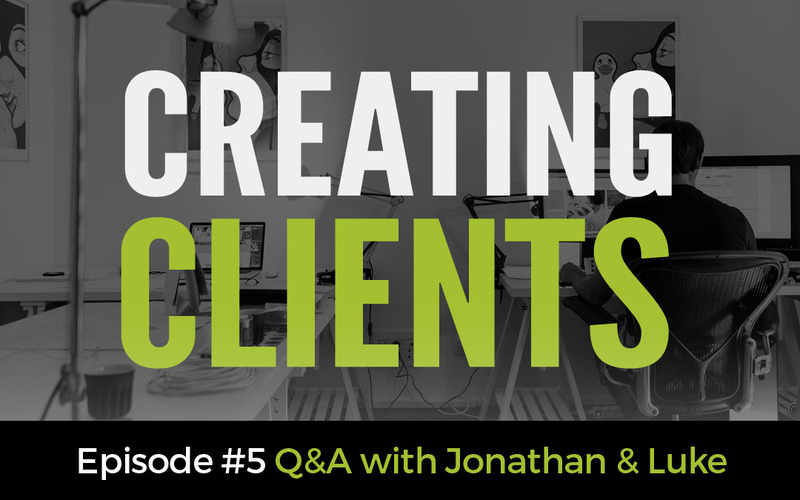 I would enjoy hearing more about how to figure out, and articulate, exactly what value you can bring to the potential client. I also appreciated the reminder that there are lots of options out there, you don’t have to go it solo, and in fact, you often need a team to be successful. So glad you enjoyed it! The concept of serving is totally central to true success. I think you will find that Jonathan and I will be bringing that up over and over again in future episodes as it seems everything is linked to that concept. As for the solo versus team idea, that was my personal crutch when I was new to the industry, I didn’t want to rely on anyone so I only worked the projects I could deliver from end to end, what that meant in reality was that I served my very early clients in a limited way because I wasn’t willing to work with anyone. There is a great lesson to be learned there!